Chefchaouen is known as the Blue City of Morocco. Like the name says most of the houses are painted blue. It was painted blue by the Jewish refugees who lived there a long time ago. It’s a popular tourist destination but definitely not too crowded. You can easily spend two days in the town just wandering around. We found out Tourism Chefchaouen is also driven by its reputation as the center of the marijuana plantations region. But aside from smoking, there are some great things to do in Chefchaouen. 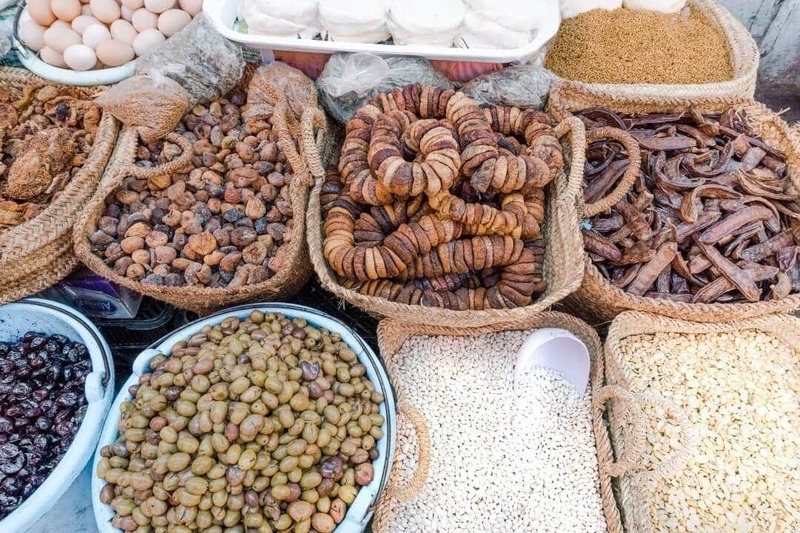 The taste and texture of Moroccan food is one you’ve never tasted before. On every corner of the slowing streets, you will find homemade bread baked in people their wood-fired ovens. At restaurants, they serve you typical Moroccan dishes of couscous, fish, spices, and vegetables. You can’t leave the restaurant without a cup of freshly made mint tea. This is a tradition in Morocco, not just for the companionship but for the health benefits, as well. Get your breakfast at Plaza Uta el-Hammam which is the town’s square. For lunch or dinner, we highly recommend Restaurant Populaire Bab Ssour. Waking up in the early morning, get to the rooftop of your riad and enjoy the most magical sunrise you will see during your trip. And if you are down in another sunset moment, then climb up all the way to the on a hill located Spanish Mosque where you will have a perfect view over the city. Also, see the 10-day Morocco Route. 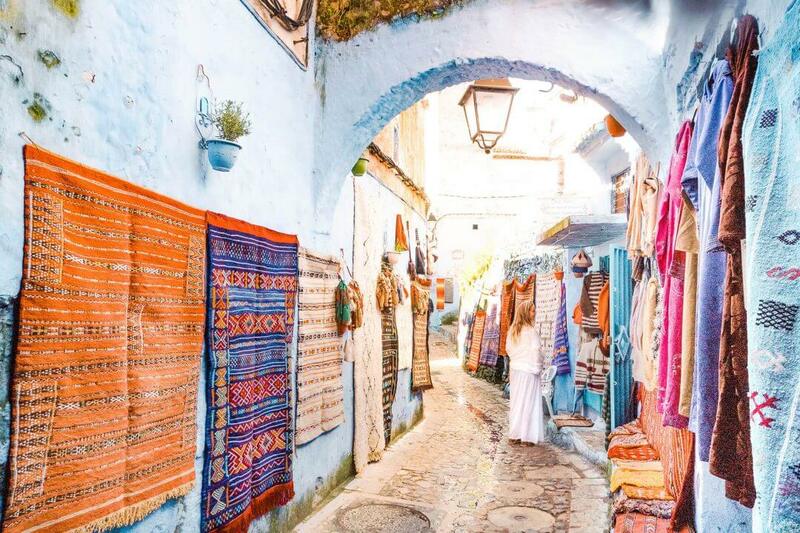 Explore the narrow alleys and steep climbs in the Medina (old blue city). Be amazed at how every corner you get around is a different shade of blue. 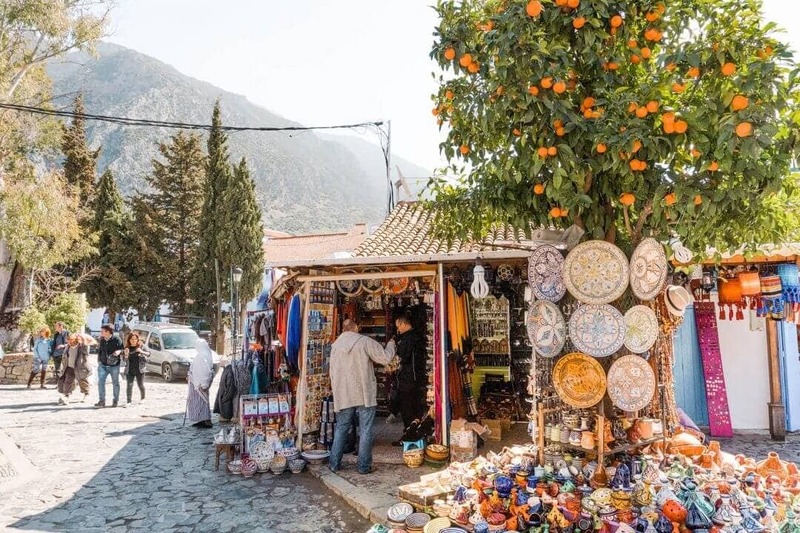 Chefchaouen is a popular shopping destination as well, as it offers many native handicrafts that are not available anywhere else in Morocco, such as wool garments and woven blankets. The goat cheese is also popular with tourists and served with many dishes. We didn’t do this ourselves but we’ve heard a few good experiences from travelers. There are 3 main things you should do if you like a to see some nature. If you’re traveling around Morocco it can be a good choice to take the local bus to Fes. The beautiful scenery you will see during the trip is worth a few hours in a bus. 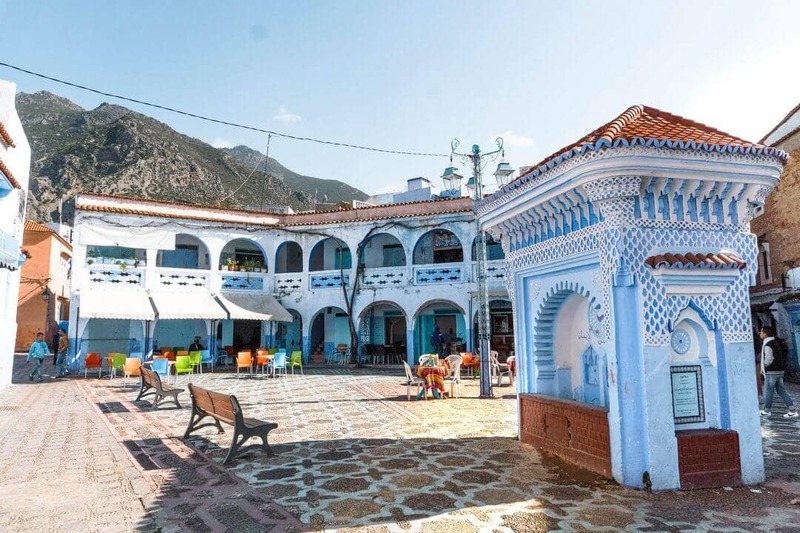 Chefchaouen can be reached by taxi or local bus from the Tangier (2,5h) and Tetouan (1,5h). It’s not possible to fly or take the train to Chefchaouen but both Tangier and Tetouan have an airport. Yes, it takes a little time to reach Chefchaouen but it is worth the journey. 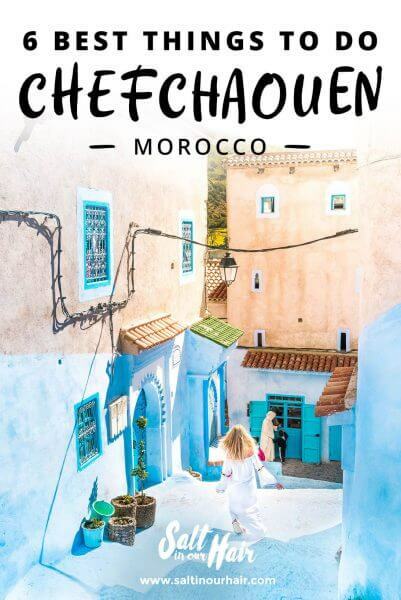 Chefchaouen has many great places to stay in. Inside the medina is a bit more expensive but there are a few great hostels you can stay in. Great AirBNB starting at $20 a night! The weather in Chefchaouen is at its best around spring (March to May) and autumn (September to November). The climate is good since it’s located in the mountains. In summer, people from the very hot part in Morocco will go on a vacation in this area because of the pleasant temperature.